When I decided to visit my friends The Poet and The Activist in Las Vegas, NV, they offered a list of places I might like to visit. The most intriguing place on the list was the Goddess Temple, more accurately known as The Temple of Goddess Spirituality. 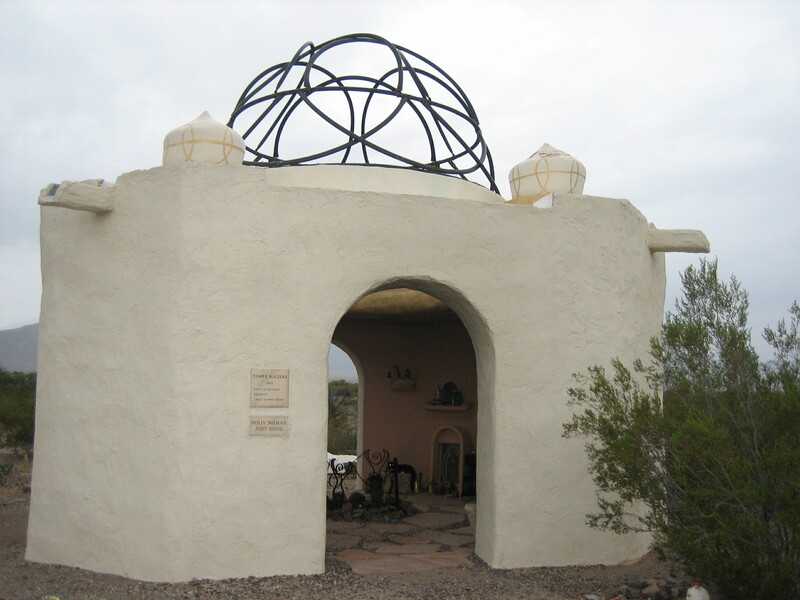 The Temple of Goddess Spirituality is dedicated to Sekhmet and is located about 45 miles north of Las Vegas. This photo shows the exterior of the Goddess Temple and a bit of the interior too. Sekhmet…is a very ancient goddess; with her lion’s head and woman’s body, she is the opposite of the Sphinx who has a man’s head and a lion’s body. Sekhmet is the goddess of four thousand names, of which only a few hundred are known to normal humans. 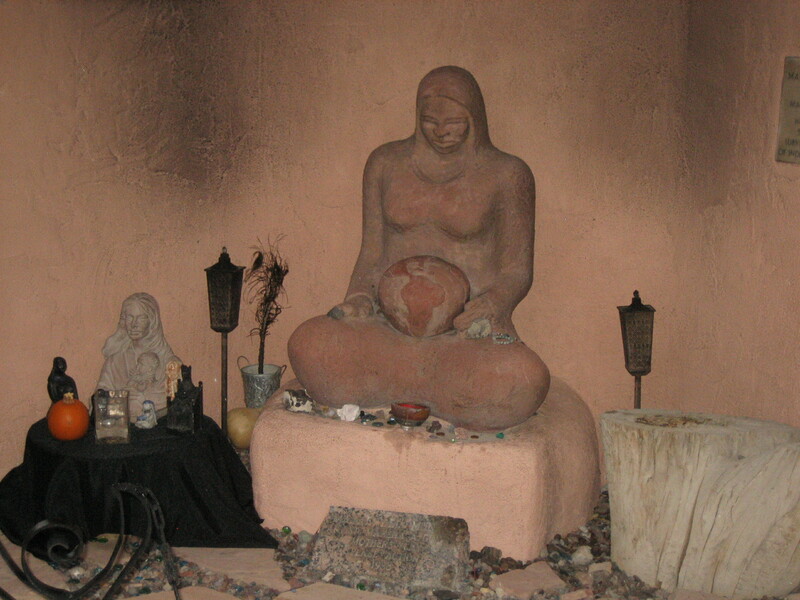 This photo shows the statue of the goddess Sekhmet inside the temple. One story about her is that she was outraged at the evil of men and wanted to destroy them but was tricked into submission by drinking a gift of beer which had been colored to look like blood. 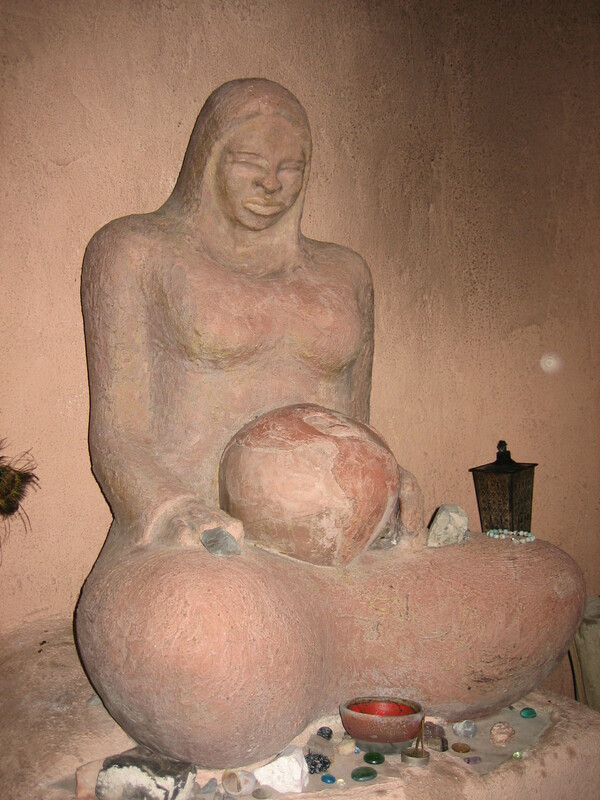 Sekhmet is “Mother Fury” and the goddess of fertility. She is the great Being in us all, the liberated planetary human animal who will not allow the destruction of a Mother Earth. There is an essay on the temple’s website written by Genevieve Vaughn, the woman who provided the land on which the temple is built. In addition to providing the land, Vaughn financed the construction of actual temple as well. 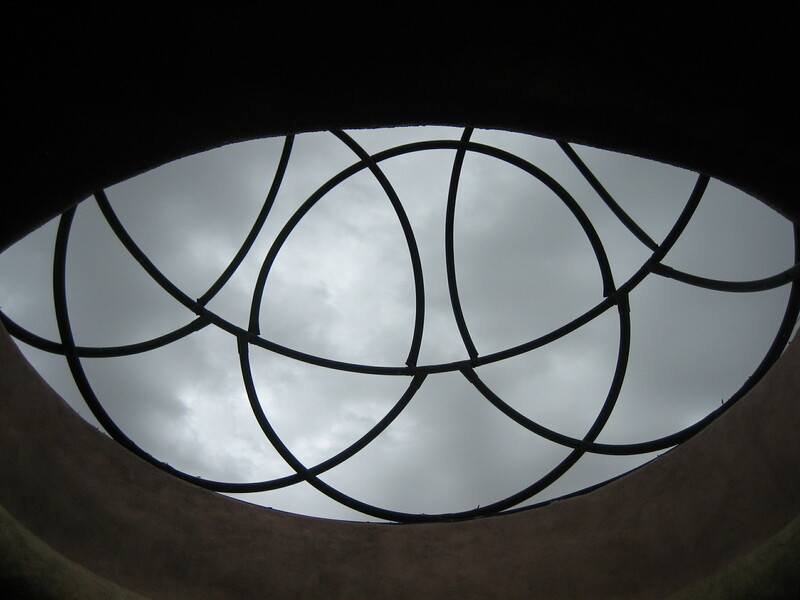 Here is the dome made of seven interlocking copper hoops. I took this photo from inside the temple. 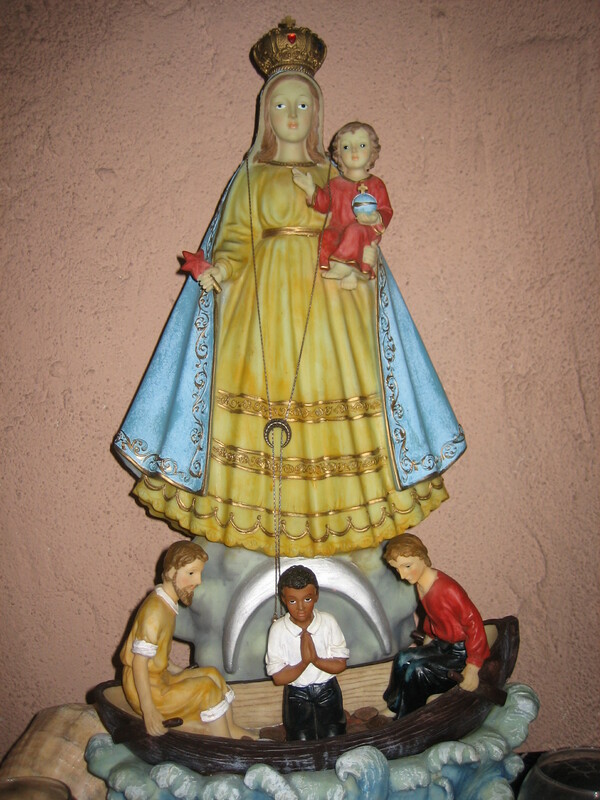 This is Madre del Mundo. 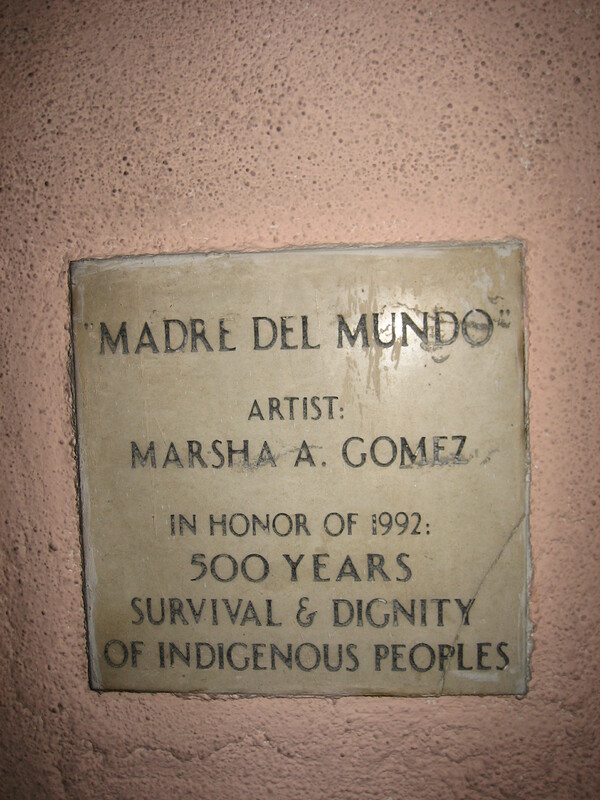 This is the dedication plaque for Madre del Mundo. 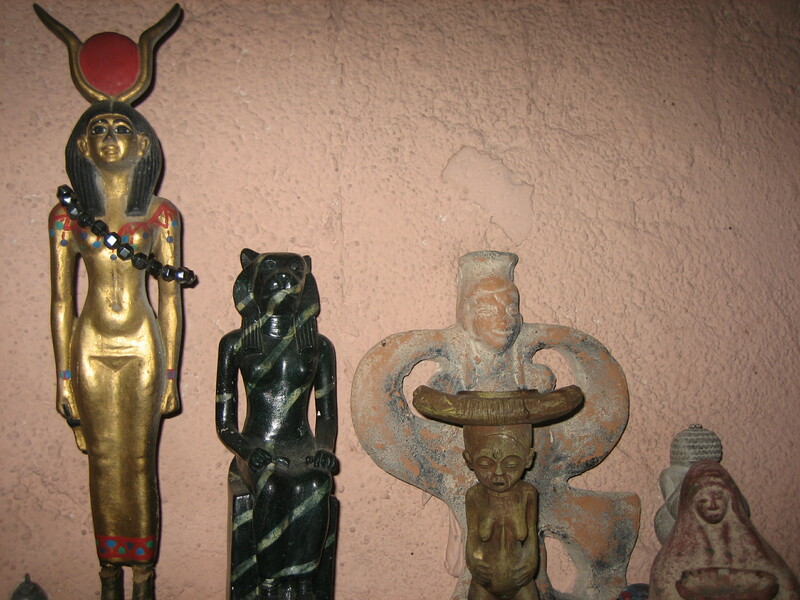 Smaller statues of goddesses of many cultures adorn the walls. Various other goddesses in the temple. Unfortunately, the photo I took of the Kwan Yin statue didn’t turn out well enough to reproduce, which made me sad. I really appreciate Kwan Yin and was glad to see a statue of her in this temple. 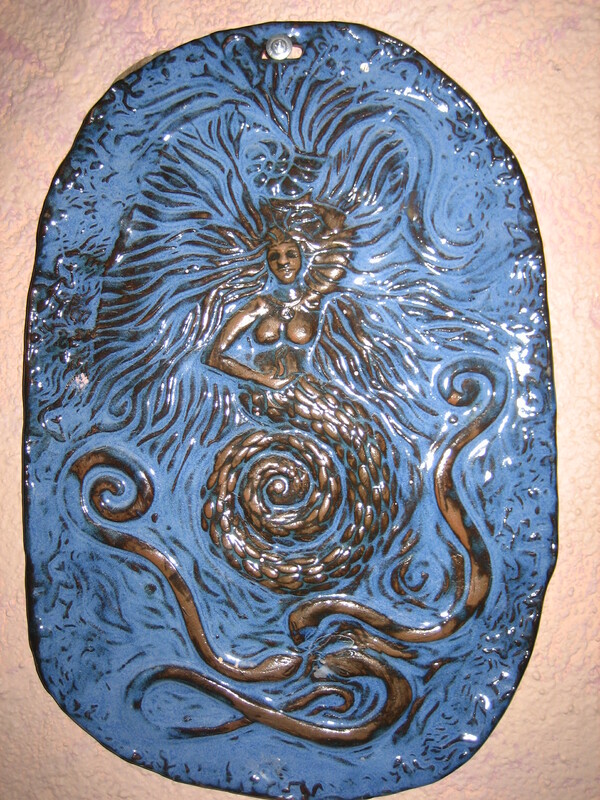 Mermaid art (ceramic?) in the Goddess Temple. I was standing just outside the temple, in one of the doorways, when I took this photo of the temple’s interior. 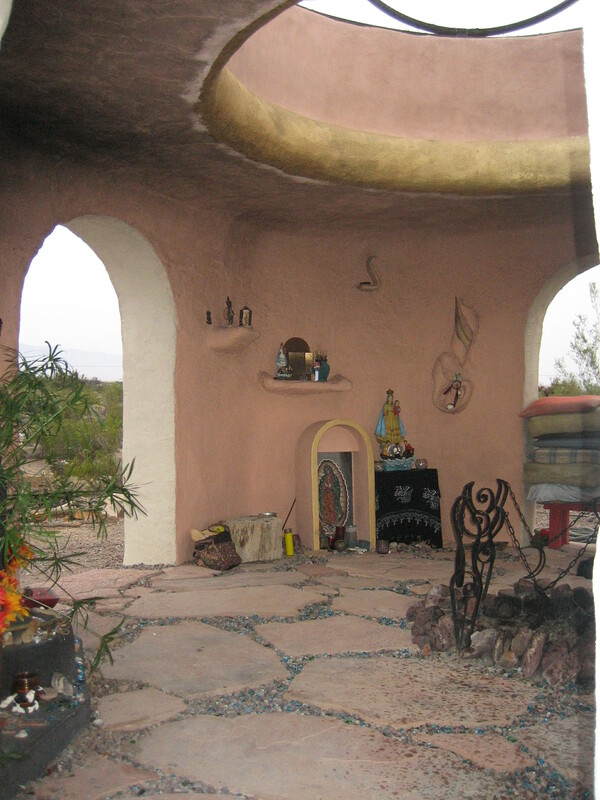 The fire pit shown in the lower right corner of the photo is actually in the middle of the temple. 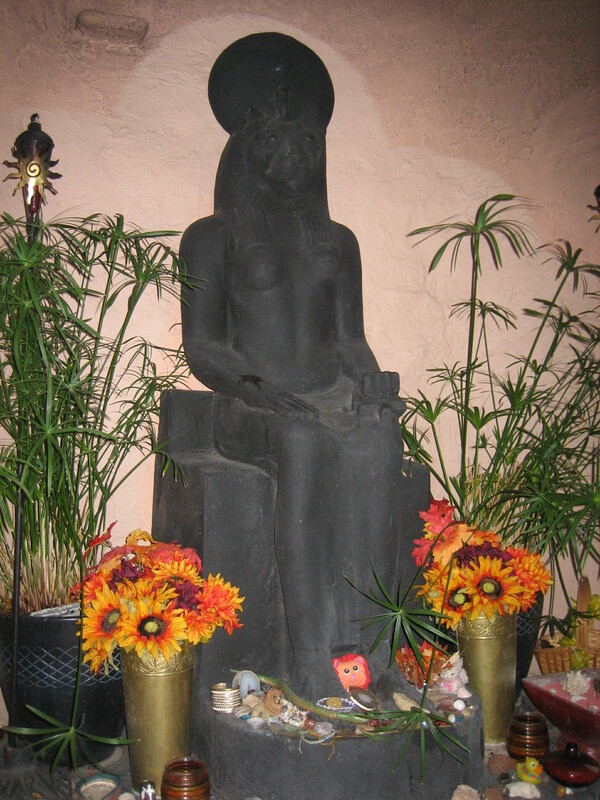 The statue of the goddess Sekhmet is just beyond the orange flowers on the lower left edge of the photo. My friends and I left Las Vegas before daybreak on the Friday morning we’d set aside to visit the Goddess Temple. We drove north through the dark. I’d expected the morning to be hot once the sun rose, but there were clouds in the sky at dawn. When we got out of the car in the temple’s parking area, the air was surprisingly chilly. I’d brought a long sleeve shirt to protect me from the sun, but I ended up using it to protect me from the cool morning air. One of the cats that lives on the grounds of the temple met us as we approached the area where the guest house and the priestess’ house are. (Yes, the temple has a live-in priestess. Unfortunately she was away at a conference on religion when we visited, so I didn’t get to meet her over a cup of tea.) The cat was black and white and fluffy and accompanied us all the way to the actual temple. 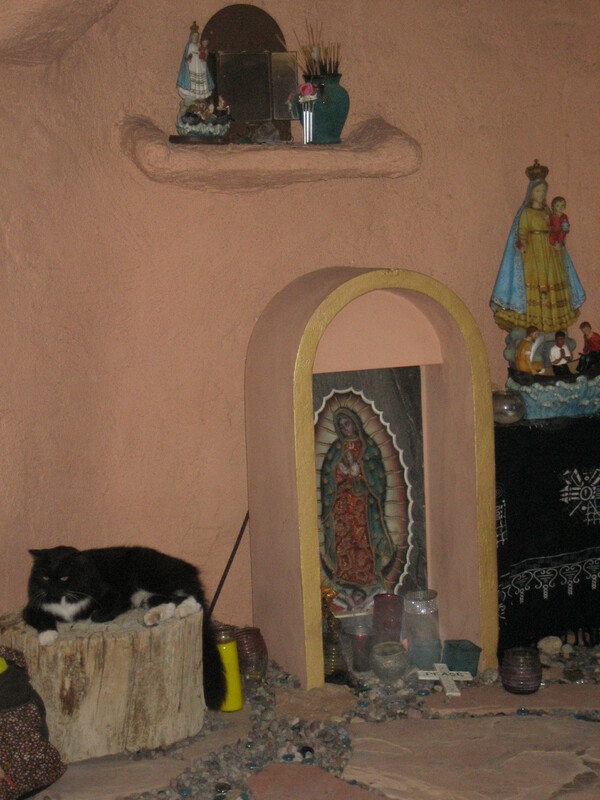 Although my friends had never seen the cat that far out on the grounds, it entered the temple with us and stayed in the area until we left, leading us back through a light, cold rain to where the car was parked. I felt we were very well protected. 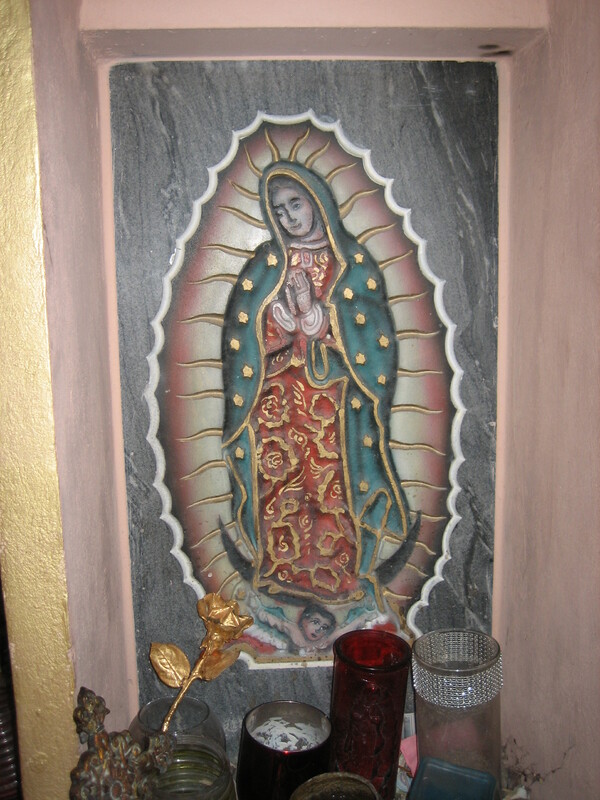 To the left of Our Lady of Guadalupe is the cat which accompanied us into the temple. We were the only folks on the grounds and the only folks visiting the temple that morning. Our visit was very peaceful. My friends did some chanting/singing from The Poet’s spiritual tradition while I wandered around looking at every little thing in the temple and taking photos. I absolutely enjoyed my visit to the Goddess Temple, and would love to visit again, especially if there were some event happening and other people to meet and talk with. Wow! I never knew that existed! I have an ambition to write a piece on Sacred Space. I may have to include that space when I do. I hope you get to visit the Goddess Temple someday, Liselle. It is a wonderful, peaceful, beautiful place. What a great article and lovely pictures of the Temple. You mentioned that you’d like to return when there is an event happening. Visitors are welcome to drop in during daylight hours, and if you’d like to stay overnight or have personal retreat time there, you can make arrangements with the resident priestess ahead of time via the contact number on the website. The temple hosts a monthly Full Moon Ceremony open to the public, a Women’s New Moon circle, and open community seasonal celebrations throughout the year. For more information, check the temple calendar at http://www.sekhmettemple.com. The temple is a very special place and that comes through in your writing. Thanks for sharing about it and I hope you will return! Blessings!!! I am glad you liked my post about the Goddess Temple. Thank you for all of the additional information you shared in your comments. I too hope I can someday visit the temple again.